In the early 1900s the whole of Walnut Creek occupied roughly the area of the current downtown. 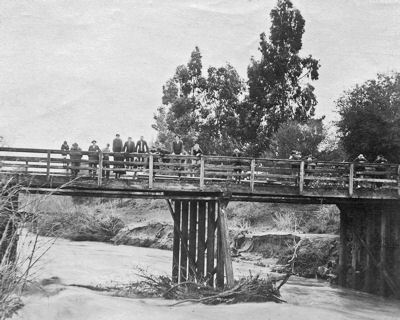 There was a bridge over San Ramon Creek about where Creekside Drive is to provide access to town from the south. The creeks were in their natural channels. People fished and swam in them and had picnics on their banks. This is not to say that there were no impacts, however. A tomato cannery on the site of the present Target store poured so much tomato waste into the creek that the water ran red during canning season. The County Flood Control District was created in 1951. The Agricultural District which preceded it built some drop structures, especially upstream in San Ramon Creek, but the channel was still essentially unaltered. The large drop structure on Las Trampas Creek just west of Main Street dates from this decade. 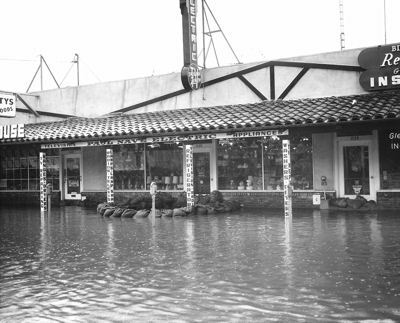 There were three major floods in downtown Walnut Creek between 1955 and 1962. 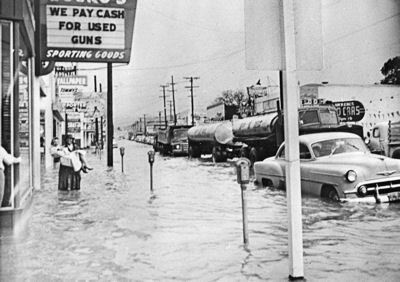 The April 1958 flood inundated 1000 homes and 100 stores. Large areas of Pleasant Hill and Martinez were also affected as the water rushed to the river. 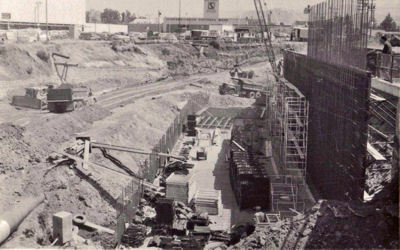 The culvert under Broadway Plaza was built in the 1960s as a result of an agreement between the City of Walnut Creek, the developer, and the County. The size of the culvert was a political decision. Since flood measurement was a less exact science then than it is now, the culvert was arbitrarily sized at eight times the calculated high water flow. John Nejedly, then the City Attorney, wanted to make sure there would never be a problem. After the floods, local interests turned to the Army Corps of Engineers for help . The Corps developed a plan involving a system of levees, drop structures, and concrete channels. Construction took six years – 1965-71. It began at Suisun Bay and proceeded upstream to Ygnacio Valley Road. The effect of all this was major changes in the streambed and flow and the riparian corridor. The creek is in a trapezoidal dirt channel from the bay to Monument Boulevard. From there to Ygnacio Valley Road it is in an open concrete box channel with very little room at top of bank. The riparian vegetation was removed for flood control purposes. Weeds and exotic grass replaced it. Salmon and steelhead were regularly seen in downtown Walnut Creek until this point, but now they vanished, blocked by the drop structures. By the end of this construction period the national environmental movement had begun. The Open Space issue was front and center in Walnut Creek. People realized that creeks had value and they shouldn’t just be constrained, boxed, and forgotten. The environmentalists took up the cause of the creeks. Among other activities, Jo Ann Hanna, one of the leaders in the formation of the Open Space, organized Las Lomas High School students to demonstrate against putting the creek in a concrete box culvert in front of their school and placing a path on top of it. Negotiations were deadlocked for more than a decade over the environmentalists’ insistence that the downtown Walnut Creek channel not be further altered. Finally after the County’s purchase of the old Southern Pacific Right of Way in the mid 1980s, all parties agreed to an open concrete channel on the right of way (now the Iron Horse Trail). A bypass structure north of Rudgear Road directs a controlled amount of water into the natural creek channel and anything above that into the concrete bypass channel. Another structure just south of Ygnacio Valley Road connects the two channels again. This was constructed in 1990-91. Later the section south of Newell Avenue was covered and the South Broadway extension put on top. Things started looking up for the creeks when Pam Romo organized the first creek cleanup in May 1990. 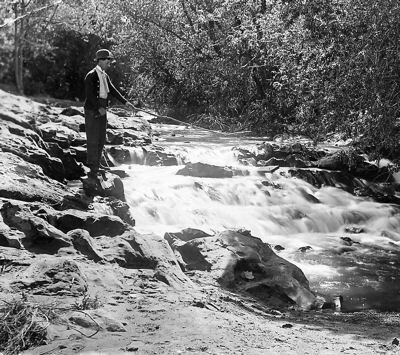 Later that year, she persuaded the City Council to establish a task force to create a plan to restore and enhance habitat on the downtown creeks and provide a trail for the public to enjoy the creeks. In 1993, the Council adopted the finished Creeks Restoration and Trails Master Plan. Task force members formed Friends of the Creeks in 1994 to work with the City to implement the Master Plan and to be advocates for the creeks.